We set out on a mission last week and had lots of fun coming up with all sorts of ways to make things glow-in-the-dark. 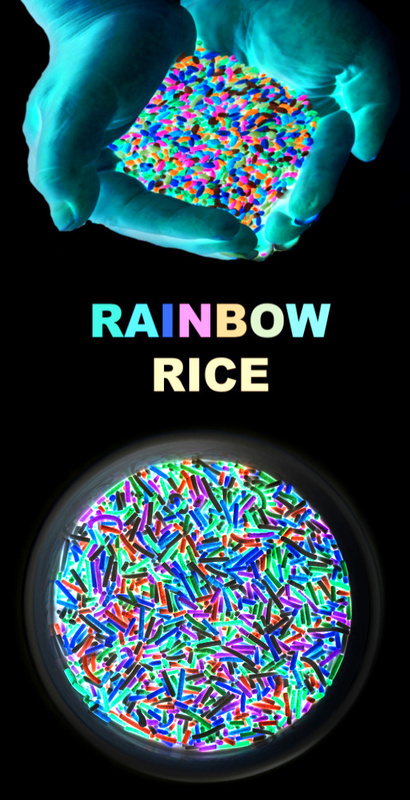 This glow-in-the-dark rainbow rice was one of our favorites, and you won't believe how easy it is to make! For all the best kids activities follow us on Pinterest & Facebook. Note: While it isn't needed I do recommend using a black light for this activity. Glow-in-the-dark paint will glow without one, but a black-light really intensifies the glow and produces the best result. You can use a black light fixture or a black light flashlight- both work great! Place 1 cup of uncooked, white rice into a large zip-seal bag, using one bag for each color of rice that you wish to make. 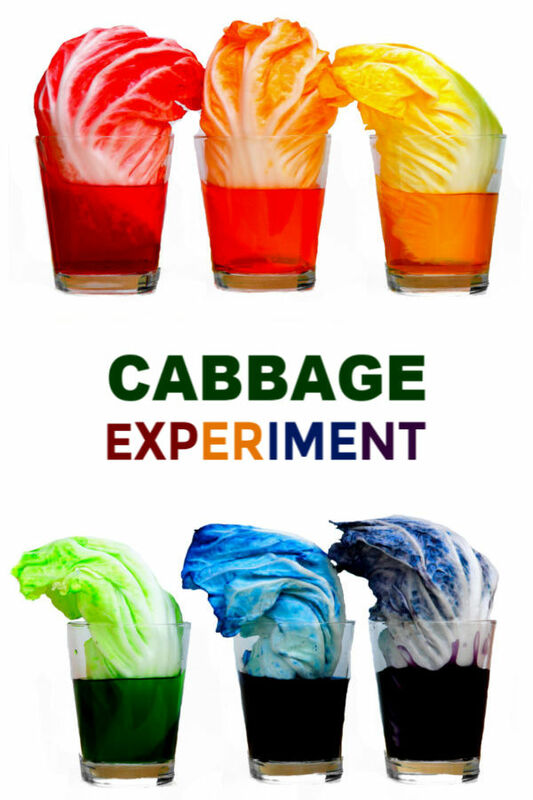 Add 1 tablespoon of neon paint to each bag. Add roughly 2-3 tablespoons of water. 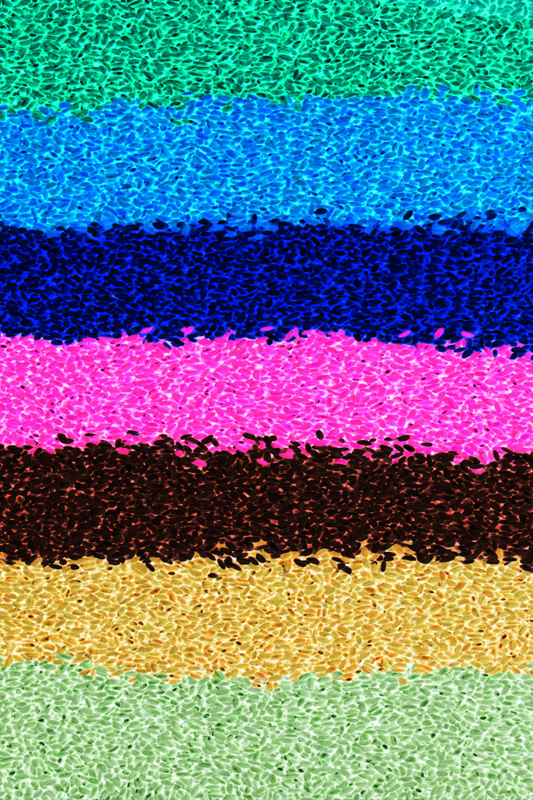 The water makes the paint runny, which helps it to coat the rice in color while allowing you to use less paint. 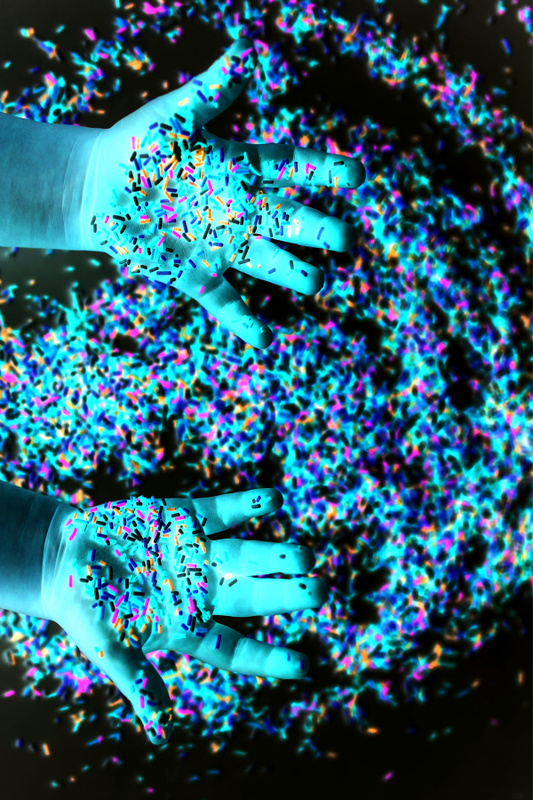 Seal the bags and then shake, knead, and mix them until the rice is fully saturated in color. Once the rice is saturated you can lay it out on cookie sheets for faster drying or simply open the bags and allow the rice to dry just like that! 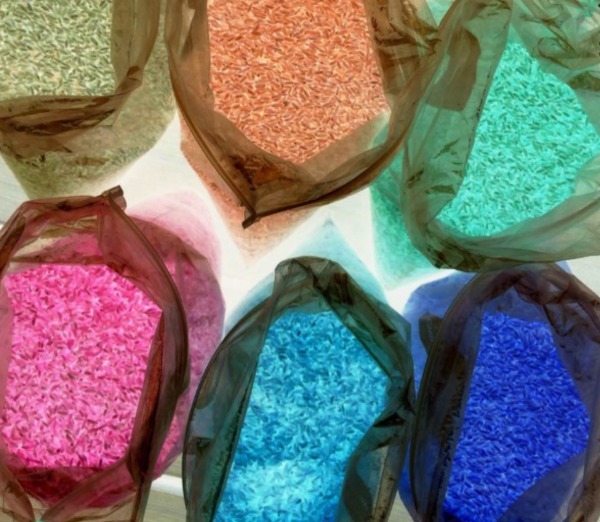 It will take roughly 4-6 hours for the colored rice varieties to fully dry. 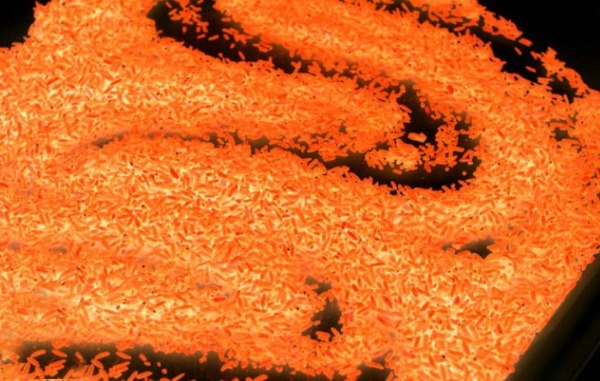 The rice may clump together a bit as it dries, but that's ok! Seal the bags and hand them off to the kids to break the rice up before pouring it into a bin for play. Add kitchen gadgets, scoopers, and other toys, and the play can begin! 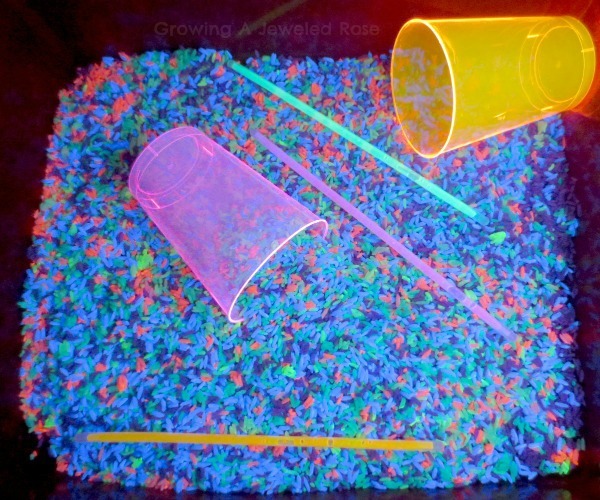 Add glow sticks, glow cups, and other fun glowing items to your rice play bin. 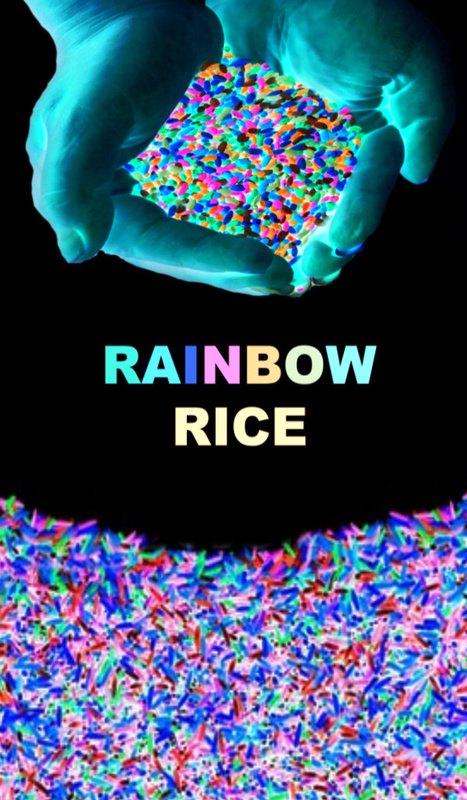 Have kids practice writing letters, numbers, and words in the rice. This is a great way to review spelling words. 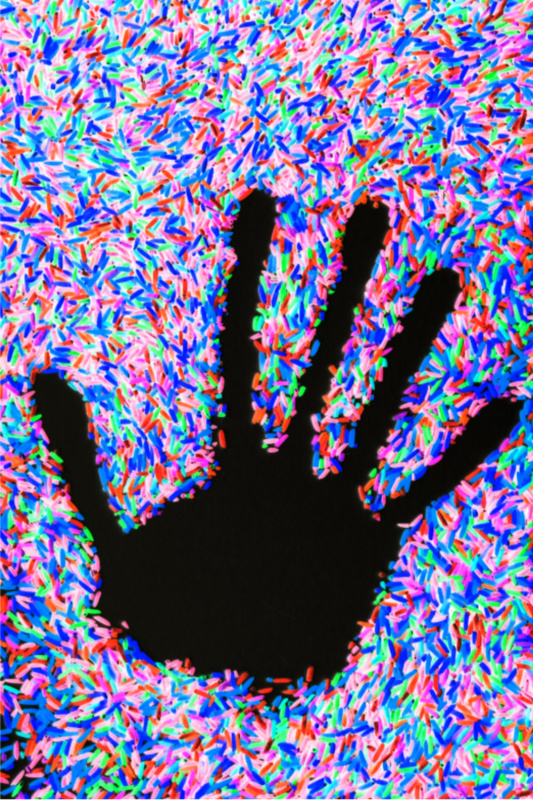 Set up a treasure hunt by hiding coins in a bin or rainbow sensory rice. 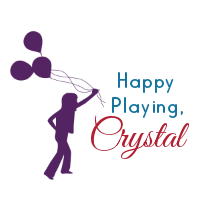 Get creative and have fun with it! The possibility for play and learning are endless! 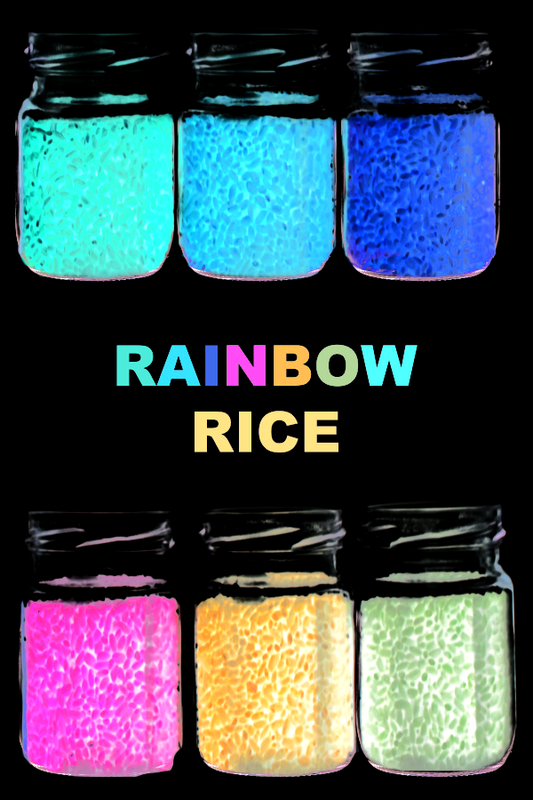 Also note that this rainbow rice is fun with the lights on, too! Store your rice in sealed jars or bags between play times, and it can be used again and again! 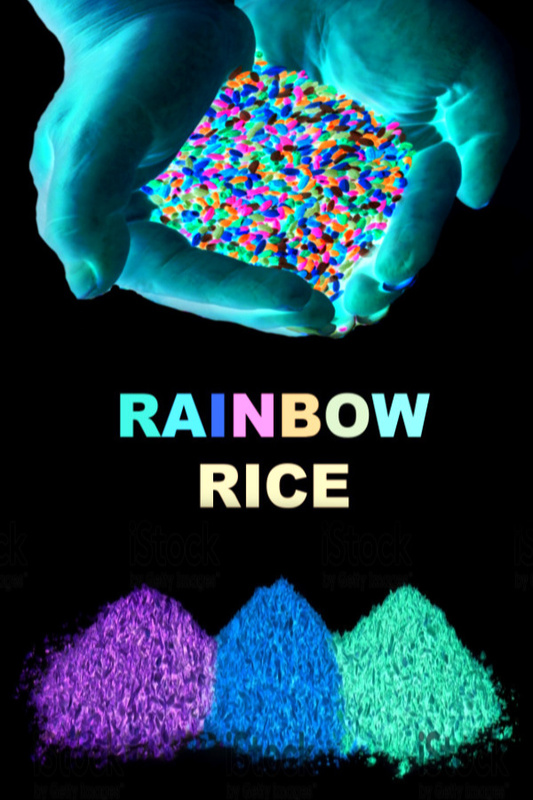 If you use fluorescent paint your rice will GLOW under a black light. 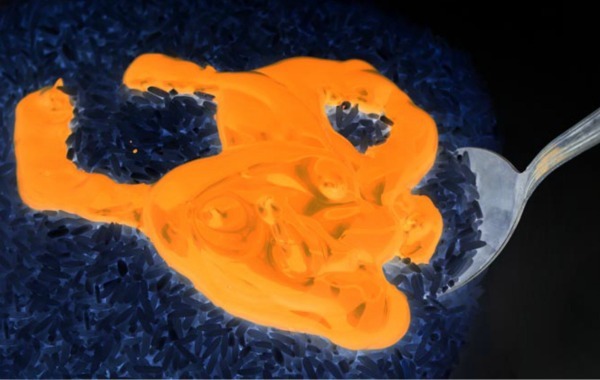 If you use glow-in-the-dark paint it will glow-in-the-dark, but it will glow much better under a black light. 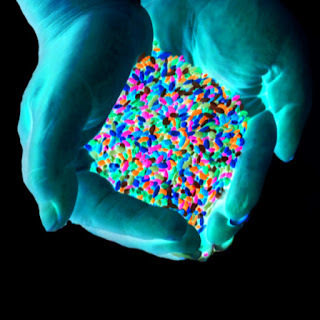 You can find a colorful variety of glow-in-the-dark paints here. 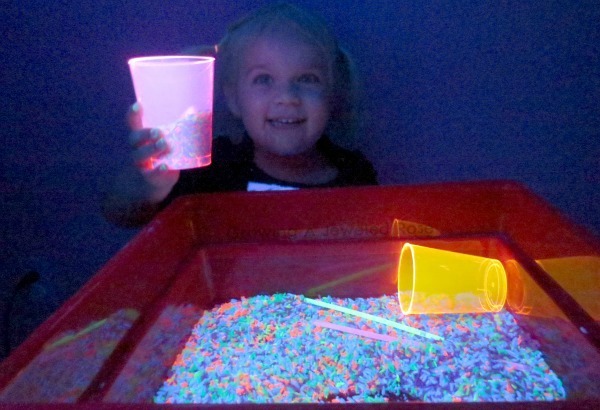 The glowing cups that we used can be found here. 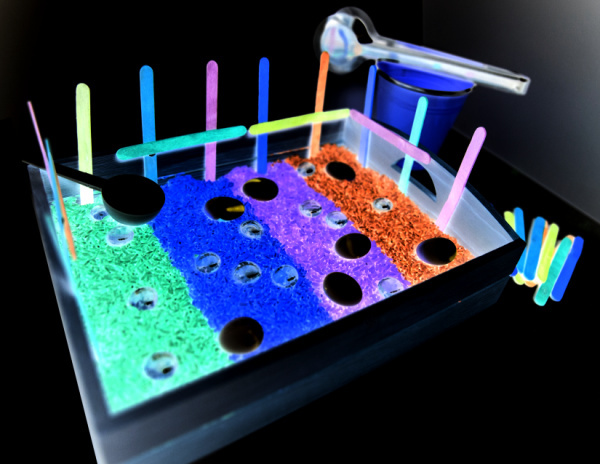 The blacklight fixture that we use in our activities can be purchased on Amazon here. We also love these super cool blacklight flashlights! 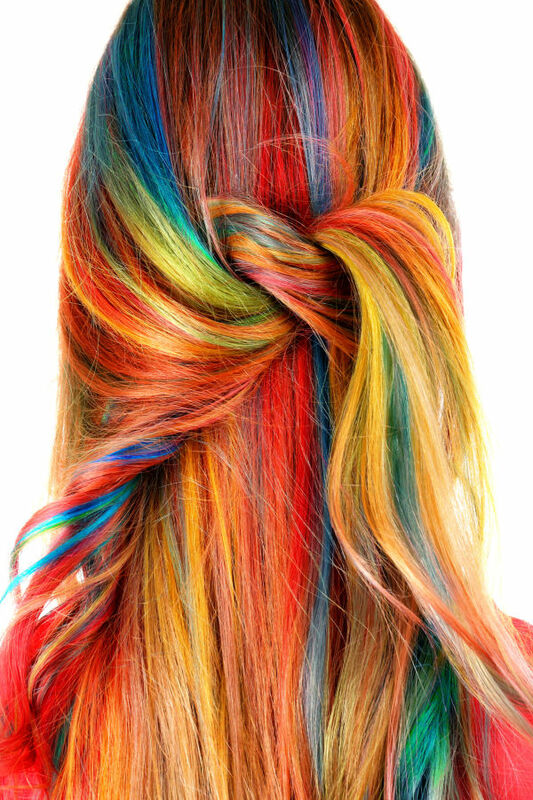 & Don't forget to follow us on Pinterest & Facebook!